Next time you visit your GP surgery you should see a brightly coloured wall-board that asks if you’re worried about your memory or that of someone you know. 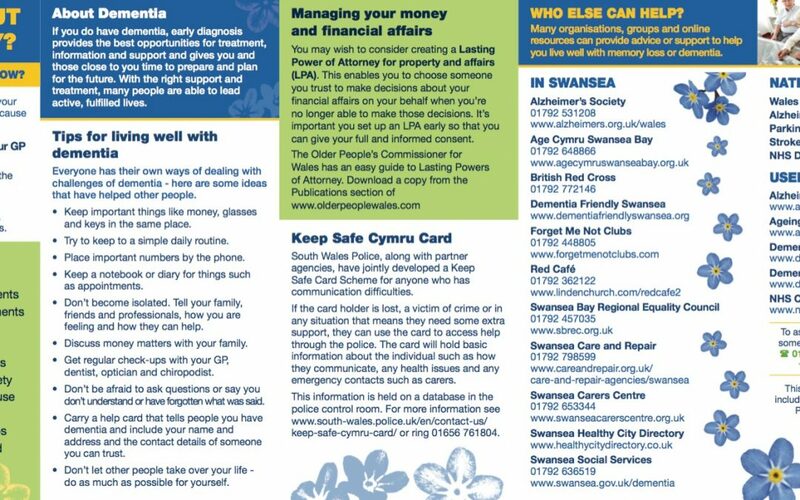 The City and County of Swansea Social Services have co-produced this board with a number of organisations and individuals including people with first-hand experience of caring for someone living with dementia. The board encourages people to speak to their GP if they are concerned about memory loss – for two reasons. Firstly, people often worry that memory problems are an early sign of dementia, unaware that there are other conditions that can also affect someone’s memory. Secondly, if someone is in the early stages of dementia an early diagnosis provides the best opportunities for treatment, information and support. Some simple checks can help a GP decide on the best approach. With the right support and treatment many people living with dementia are able to lead active, fulfilled lives. A range of organisations offer a wide variety of help and support, both to the individual and to their families and carers. Information and their contact details are included on the display board. There is also a leaflet available which you can pick up and take home for future reference. This includes tips for living well and a list of useful local and national phone numbers and websites. There is also information on the Social Care and Wellbeing section of the Council’s website.